This year I'm participating in a blog series called Handmaking the Holiday! I'm working with a few other bloggers to bring you some great ideas on how to handmake everything holiday from gifts, to decorations to yummy treats! I hope you enjoy following along and are inspired to handmake your holiday! It seems like Christmas sneaks up on me every year, but every year I say that I'm going to start early and get things done. Sound familiar? Hopefully that doesn't happen again, but I thought I'd share some smaller projects that can be done the last minute or that you organized people can get done early for stocking stuffers! Everyone loves those little unexpected treats you find in your stocking! One of my stocking stuffer favorites is a tutorial that I've shared earlier. It is my Pocket Tissue Holder. 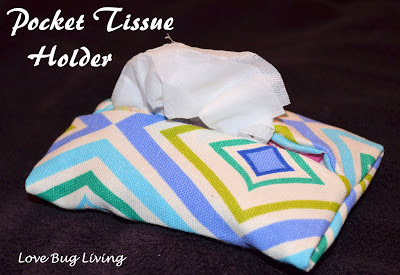 A quick and easy sewing project that would be great for anyone. Another great stocking stuffer for Mom or a teacher would be these adorable Hand Sanitizer Holders by A Lemon Squeezy Home. Looking for that perfect stocking stuffer for Dad? 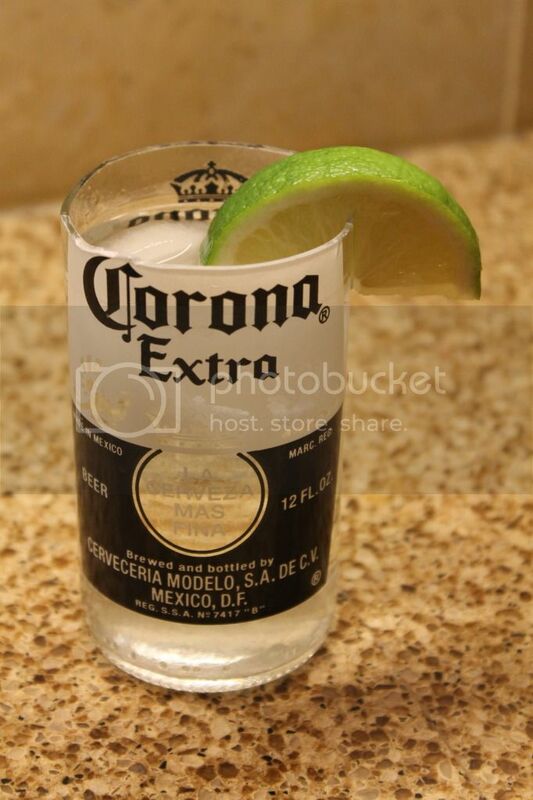 How about Corona Glasses made out of beer bottles that I found over at 366 Days of Pinterest. My hubby would love these. Maybe Dad is more of a coffee drinker. You could make him his own hand painted mug. I love this Herringbone Mug I found at Wit & Whistle. 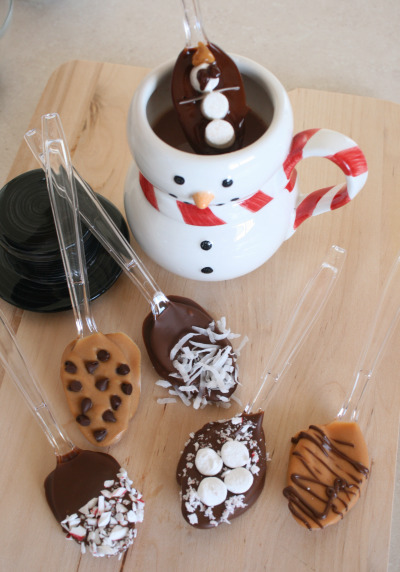 These Chocolate Dipped Spoons at Alphamom are the perfect compliment to a mug. I will definitely be making some of these this year. This Fabric Chalkboard Tutorial from Muse of the Morning is great to take along on trips and out to dinner. This Seek & Find Bag is another great toy to keep the kids busy on a road trips or easy to throw in your purse and bring out while you are shopping. What kid doesn't love play dough? This DIY Playdough recipe from Modern Parents Messy Kids is made out of jello. The colors make it look good enough to eat! We can't forget baby! How about a Family Board Book by Chef Messy. Babies love to look at faces and ones they know are even better. Why not make your little one their own book. One of my most visited projects are these Baby Leggings! 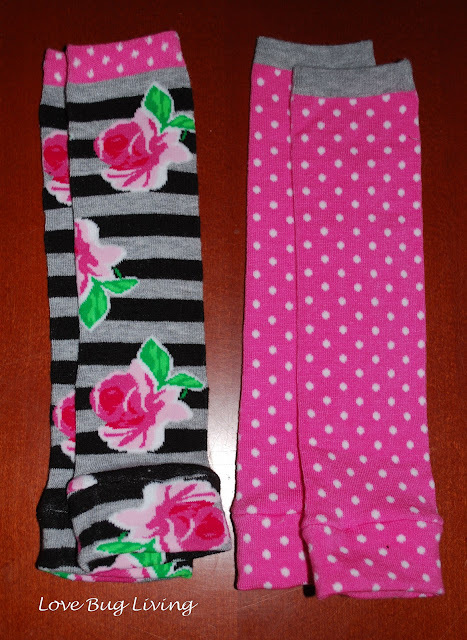 Made from knee socks, they are great for boys or girls. They make diaper changing so much easier! Maybe you have a candy lover in the house. 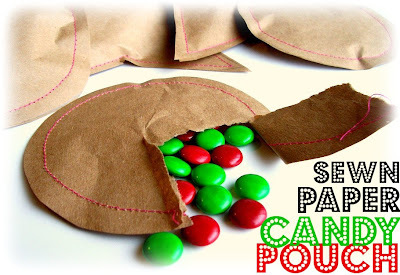 I love these Paper Candy Pouches by Peppermint Plum. Ordinary candy gets a fun package! Maybe you need a stocking stuffer for a teen. This Circle Zip Earbud Pouch at Dog Under My Desk is so fun and I love that they can attach it to their backpack or keychain. Personalized jewelry is always a great gift. 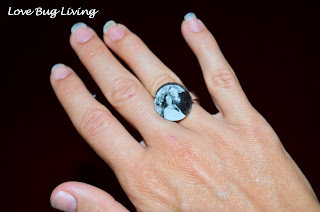 The Photo Pendants from Ginger Snap Crafts are beautiful and I've made a similar Photo Ring. I hope you were inspired by some of these stocking stuffer projects to create your own little gifts! Be sure to stop by and visit Sandee from In the Hills of North Carolina to see what she will be sharing on Friday! Nice round-up Melissa!! Thank you for joining Handmaking The Holidays!! Great round-up! I've been meaning to make the photo board book, and I love the idea of the chocolate dipped spoons! I might do that as neighbor gifts this year!